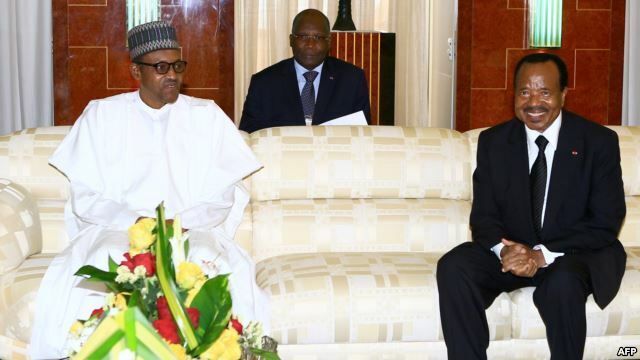 Nigeria's new president, Muhammadu Buhari, has left Cameroon after a two-day visit that included talks with Cameroon's president, Paul Biya. Key topics included the Boko Haram insurgency that has spawned much deadly violence and continues to claim lives. Buhari said he will collaborate with Cameroon, Chad and Niger to stop the six-year Boko Haram insurgency in the shortest possible time. Buhari said there should be trust and confidence among countries that are contributing troops to fight the terrorist group. Buhari added that his visit to Cameroon, which ended Thursday, bolstered support for a multinational army to fight the uprising, and he said he was optimistic the joint forces will be operational within 30 days. "We cannot afford to falter in our resolve to rid our countries of this evil that is threatening to destroy our hard-earned freedoms and what we have achieved as individual countries and collectively in our sub-region," said Buhari. "We recognize that none of us can succeed alone. The federal government of Nigeria is committed to respecting international norms to resolve this matter and to restore normalcy to all affected areas as soon as possible," he said. The insurgency has claimed at least 60 lives in suicide bombings in Cameroon in recent days. Cameroon's president, Paul Biya, said they, more than ever before, need the support of all countries in stopping Boko Haram. He said terrorism is today a global threat that requires a global response, and only a global fight against it can assure the prosperity of our people and guarantee the world of its peace. The violence has displaced about 2 million people and killed 20,000 in Nigeria, Cameroon, Chad and Niger.